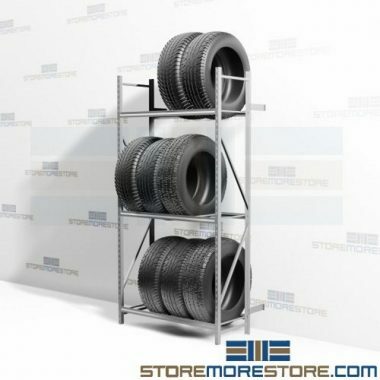 Create sturdy and flexible large truck wheel display wall storage shelving with heavy-duty adjustable tire racks that have a tool-less boltless design. Users can assemble it in moments using minimal and easy-to-install parts that provide added capacity. With up to 3800 lbs. in capacity per level, personnel has efficient space to organize everything. It keeps the floor clean and accessible to browsers wanting a closer look at the in-stock selection. A wide-open front provides improved visibility and ensures safer handling during retrieval to prevent injury. The heavy-duty adjustable tire racks have versatile horizontal beams that accommodate changes in 2″ increments with hooks on the ends to ensure a positive connection. With wall brackets to facilitate proper installation, users can optimize underused spaces. It provides a more efficient alternative to letting these areas go to waste. Facilities get to maximize use with shelves sturdy enough to keep everything safe and organized. 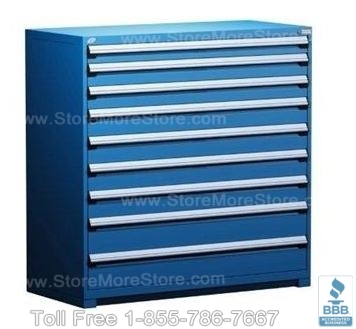 Construction: Made from heavy-duty steel durable enough to provide long-lasting reliable service. Posts: Sturdy 14-gauge steel uprights measuring 1 – 3/4″ x 1 – 3/4″. Shelves: Boltless heavy-duty 12-gauge horizontal beams allow adjustments in 2″ increments with three hooks on the ends for positive connection. Wall Brackets: Four rack-to-wall brackets included to speed installation. Units measuring 96″ wide: Can support 2,150 lbs. per level. Systems that measure 72″ wide: Hold 2,750 lbs. per level. Units measuring 60″ wide: Can support 3,800 lbs. per level. 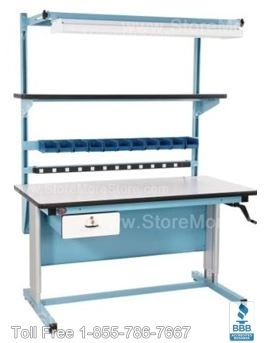 Systems measuring 60″ x 18″ x 72″: Can accommodate 21 tires. Units that measure 72″ x 18″ x 72″: Hold 27 tires. Systems measuring 96″ x 18″ x 72″: Can accommodate as many as 36 tires. Units that measure 60″ x 24″ 120″: Hold 21 tires. 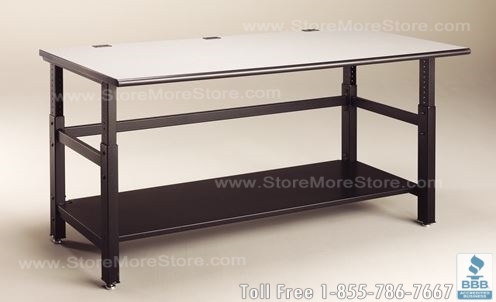 Systems measuring 72″ x 24″ x 120″: Can accommodate 27 tires. Units that measure 96″ x 24″ x 120″: Hold 36 tires. Finish: Gray powder coat finish provides an attractive and clean look. Warranty: One-year manufacturer’s limited warranty. Heavy-duty adjustable tire racks are available to buy online and ship within 3-4 weeks with free dock-to-dock shipping included. If you need any assistance or just want some help picking out the right solution for you, please call us at 1-855-786-7667. Automotive repair shops often have multiple types of tires that all need to be stored at one time. Since space is limited, this sometimes results in a messy tire storage area that is difficult to navigate. Staff members resort to stacking tires on top of each other in whatever corners they can find. While stacking can damage tires during storage due to their weight, it also prevents staff from safely and efficiently retrieving them. 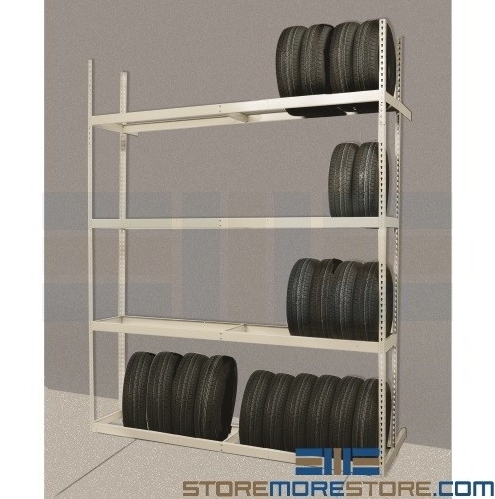 The tire storage racks provide a full solution for space savings and proper storage. Instead of stacking, users store tires upright in their own space. With tires stored next to each other, there’s no space wasted in between. Users can simply grab a tire and go instead of having to stop and move other tires out of the way. 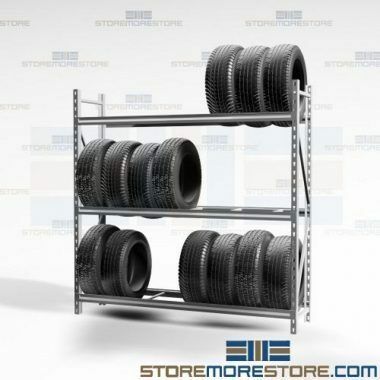 Tire storage racks are available to buy online and ship in 4-5 business days. For further assistance, call us at 1-855-786-7667 or send us a message to speak to one of our experts. Automotive parts and equipment can be difficult to store due to their bulkiness and shape. Improper storage could lead to parts damage or even injury upon retrieval. As specialists in automotive storage systems, we have a variety of specialty storage racks for storing whatever you need efficiently and in less space than traditional racks and shelving. Storing floor mats? On regular racks, the shelves in between can either be too big or too small to fit all of your mats. These racks are designed specifically for storing floor mats. Adjustable shelves allow you to set your desired height so you don’t waste any space above or below. Due to their non-standard shapes, storing automotive parts on shelves can end up wasting a lot of space. It’s also difficult for staff to access parts and provides low visibility. 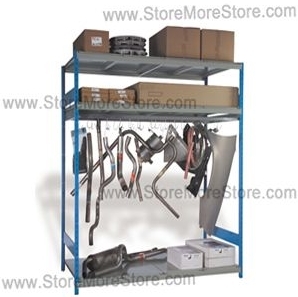 Hanging parts racks are great for mufflers, tail pipes, fenders, and other parts that are difficult to store on shelves. Hanging your parts instead of storing them horizontally allows you to make better use of space and makes parts easier to see for faster inventory and retrieval. Tires are heavy and expensive. Improper storage, like stacking, also risks damage to tires. Either you have to buy new tires, or a customer recieves an unknowingly damaged tire. Instead of stacking tires on top of each other, the tire storage racks allow you to store the tires horizontally in their own space. Since windshields are glass, it’s especially important that they be stored properly and not stacked or in areas where they can be easily damaged. 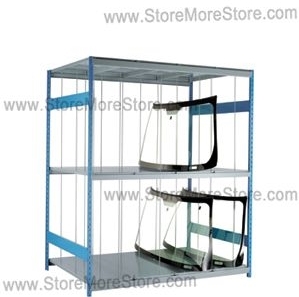 The windshield storage rack allows a space for every windshield you need to store in its own vertical space. Its double-tiered design saves space to store these bulky items efficiently. 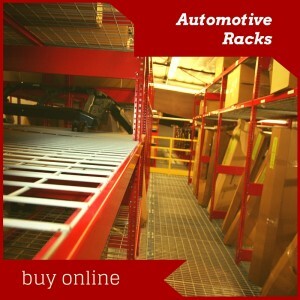 A wide variety of specialty storage racks for automotive parts are available to buy online. For more information or additional assistance, call us toll free at 1-855-786-766.